The legendary volcano Mount Ymawaah suddenly appears near the city of Carnassat, unleashing a wave of fiery creatures on its citizens. Even worse, the volcano shows signs of erupting soon and destroying everything nearby. Only brave adventurers can discover who sent this destructive mountain to the city, learn this creature's enigmatic purpose, and stop it before this city comes to ruin and destruction! This installment of the Deadly Delves-series clocks in at 29 pages, 1 page front cover, 1 page editorial, 2 pages of advertisements, 1 page SRD, 1 page back cover, leaving us with 23 pages of content, so let’s take a look! All right, this adventure takes place in the city of Carnassat (full statblock provided), though it can be slotted relatively easily into pretty much any world, just replace it with another city and you should be relatively good to go, provided there are enough folks to hold the city without trivializing the actions of the PCs. Carnassat, while lawful per se, is obsessed with gambling, so that would be a pretty good excuse for the PCs to be in town; otherwise, the city is not mapped per se and acts as a backdrop for the first act of the module. Relevant for the GMs that are less confident in their ability to improvise flavorful descriptions: The pdf does feature read-aloud text and DCs in the text etc. are bolded for your convenience, making that aspect pretty comfortable. Now, there is one more thing that you should be aware of: This first act of this adventure can be easily expanded, pretty much like a type of event book of sorts; if you have books that deal with volcanoes and the like, this is very much the time to pull them out. It should also be noted that there is a distinct chance that the PCs will end up with a potent, artifact-strength magic item, the molten mantle, which may also act as a catalyst for future adventures, planes- and world-hopping. They will also probably end the module with a powerful, magical apparatus. It’s easy enough to deprive the players of these prizes, but depending on your plans for your campaign, the items might either be considered to be intrusive…or an awesome plot-device. Either way, the items are definitely worth pondering prior to running the adventure; the apparatus can easily be locked in, the mantle taken by the potent entity that made it. The pdf does contain a new monster (with a rather cool full-color artwork, the CR 8 pyroclastic wight: These things can generate nasty terrain, fir lava bombs and have a nice means to deal with them. All in all, a cool critter. All right, this is pretty much as far as I can go without serious SPOILERS. Potential players should skip ahead to the conclusion. All right, still around? Just as the PCs were enjoying a fine evening in the Pot and Kettle, things immediately become horrid. Basically, building falls, lower level characters die: An earthquake rocks the tavern, crashing down on the PC’s heads. There are survivors to be saved beyond the PCs, but things won’t let up: In a haze of dust ad eerie glow, raging fire elementals scour the city…and once the PCs have dealt with these huge, berserking brutes, they will have had their fill for the day; but in the dusk, they’ll notice a sight that is sure to be disquieting: On the horizon, a mountain now looms where none was before! The PCs are invited to an emergency meeting with the local guildmaster; after all, who else could deal with…well, such a strange and potentially deadly situation? The guildmaster can actually identify the volcano: It’s Mount Ymawaah, sacred engine of destruction of the Elemental Queen of Fire. In case this sequence of words wasn’t ample clue for you: This is really bad news, for the volcano is notorious for appearing…and then erupting, within 3 days, killing everything is a huge radius. Hard time limit – smart! Seems like it’s up to the PCs to placate an angry elemental quasi-deity…right? Well, things are not that simple. First of all, the PCs will have to navigate the outer crust of the volcano; here, a planned encounter with fire drakes is waiting for the PCs. Unfortunate: The text references a random encounter table that seems to have been cut from the module. The entryway to the outer caves is guarded by fire giants – it should be noted that their leader is a modification of the Strngarm from the Monster Codex. Beyond the giants, though, an easy riddle in a shrine can yield a hint to an issue later that level and a custom haunt, a scream of obsidian shards, can be encountered and a forge of magma houses salamander smiths, fully statted, The theme of fire is progressed with nice ideas – we don’t just get magma oozes, we get magma oozes infused with poison and even a massive, 13-headed pyrohydra! Okay, so far, we have a fire-themed dungeon, just as we expected. This, however, is where the module becomes MUCH more interesting: After defeating the hydra, the PCs will get the thoqqua apparatus – which they can pilot through magma to the heart of the volcano! This is amazing…and it comes with full stats and all. I really loved this…but ultimately, the module doesn’t do too much with it; it just remains a means of transportation, when the journey through the molten flows could have been one amazing section; if you run this in your home-game, do me a favor and employ this to its amazing potential. I mean, come on: Magma-diving, magical tank? You *have* to have some epic encounters there! The PCs thus arrive at the second level of the dungeon, the sanctum of pure fire, where the molten variants of iron golems, nessian hell hounds and other infernal threats (like an ice devil – the encounter has the fun title “Not a snow-ball’s chance…”) loom…oh, and the PCs get a taste of the pyroclastic wights, the things that will rise from those slain by the sacred volcano if the PCs fail. It is also here that the PCs can find the fully-statted efreeti inquisitor (CR 10) Siad Barkan, held as a prisoner…and he is an agent of fire. The inquisitor can easily fill the PCs in regarding the true plot here: The protean Ecarnamish has taken over the mountain, and the entity has effortlessly bested Sian, who proposes an alliance…though the inquisitor isn’t that big of a help. Another shrine allows the PCs to gain a one-time boon…if they survive drinking sacred flames that bypass all resistance and immunities…but if they do, they have a potent tool at their hands. Ultimately, though, the PCs will have to once more navigate the thoqqua apparatus even deeper into the burning heart of the volcano, reaching the final level of the dungeon, where the infusion of chaos matter into the lava (hence, chaosfire…) takes place: The protean’s plane-splicing has tainted the lava here, and appropriate guardians await: Like acid-infused dire crocodiles, lightning elementals and a frost worm – all potent foes, with energy-type-changed pools awaiting…and finally, the PCs will encounter the protean mastermind, who is btw. a pretty brutal imentesh protean arcanist 10 with potent spellcasting, nasty melee tricks and a pretty detailed tactics/during combat section – most assuredly a fine BBEG. If the PCs don’t want to give up the mantle that allows them control of a planes-hopping volcano/weapon of mass destruction, then they will also have to best Siad…which, after the boss, will be one tough cookie… The pdf does provide notes on concluding and continuing the adventure, just fyi. Editing and formatting are generally really good on a formal and rules-language level; I did some reverse-engineering with the statblocks and noticed no obvious hiccups. Layout adheres toa nice two-column full-color standard that fits a lot of text on each page – this module is surprisingly long for its page-count. The borders of the pages look a bit like molten rock, which is a nice flourish. The interior artworks are full-color, original and nice. The cartography is also full-color and comes with an extra-pdf of player-friendly versions of the maps. The maps aren’t particularly aesthetically-pleasing or detailed, though. Joel Flank’s “Chaosfire Incursion” is a module that starts off with a great bang: The first act is cool and makes clear that the stakes are high; the first dungeon level is a deliberate feint, making it look like a themed dungeon, which is partially true; once the PCs have found the apparatus, things become amazing, though: The idea is glorious. That being said, there are a couple of minor hiccups I need to mention: The random encounter table missing from the file is one down-side, though not my biggest complaint; so, the PCs have basically a magma-tank, right? Where are the sequences where they have to navigate streams of magma, avoid lavafalls, etc.? Where the engine gets stuck and the PCs have to defend the vessel against endless, burning hordes while it’s rocking on a literal sea of flame? I mean, come on! We get the stats for the vehicle! And yes, any GM even half worth his/her salt can add that, but the absence of any such sequence is still utterly puzzling to me. It’s the coolest idea in the whole adventure! That being said, this still sports some seriously nice scenes: The monsters are often modified in unique ways; the module is challenging and the final boss appropriately brutal. Moreover, we a) don’t get many modules in the high-level range and b), the artifacts that can be gained, while potentially problematic, can make for absolutely fantastic ways to transition the PCs from regular adventuring to the wonders of the planes. This module, in short, is certainly well worth running; perhaps even more so for what may follow in its wake. How to rate this, then? Well, while this is almost excellence, it does fall short of e.g. the truly excellent Gilded Gauntlet, but it still remains a neat adventure. Hence, my final verdict will clock in at 4.5 stars…though I have to round down for the purpose of this platform. Now available at Paizo.com. written by Joel Flank. Added to my wishlist (my daughter's end of year trip to the Rockies in British-Colombia is harming my RPG purchasing power). Definitely look like something I can use and I always love to have new cities (partially) fleshed out, they are always great to drop here and there when needed. I'm super excited this is finally out. Thanks to everyone at JBE for making it look great, and thanks to Pompeii and Mount Kawah Ijen and its blue lava for inspiration! If it's a little juvenile, it's completely unintentional. Even with you explaining, I'm not sure exactly where you're going there, unless you're suggesting it's too close to "your mama", in which case I don't see it as close enough without really forcing a false rhyme. Be sure to check out this adventure, an all our other Pathfinder adventures at Paizo.com. Be sure to check this adventure out. Not that many 11th level adventures out there. As a matter of fact, Deadly Delves: The Chaosfire Incursion is one of only 5 11th level adventures that are not part of an adventure path or Pathfinder Society. Download today. Have you tried out this excellent adventure yet? At 11th level, three are few others available like it. After surviving The Gilded Gauntlet, test your metal in the Chaosfire Incursion. This is currently our highest level adventure available, but it won't be for much longer. Soon we will have a 14th-level adventure available for your Pathfinder game. Going beyond level 10, download this adventure today. Looking to go beyond level 10 this new year? Download this adventure today. In a few short hours, this will no longer be our highest level adventure. In fact the new adventure being published is level 12, so you can run this adventure for your group and then Deadly Delves: 9 Lives for Petane for them right after. Just in case you want to check out Deadly Delves: 9 Lives for Petane, you can find it right here. Because of your feedback, we reduced the price of this adventure to $6.95. Thank you for taking the time to review it. I really appreciate it and am glad you liked it. Charging forth into the higher levels? The Choasfire Incursion is an excellent adventure for doing just that. Hey 5e fans, do you want to see this adventure converted to D&D? 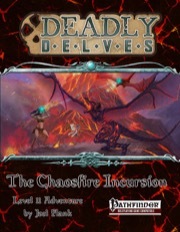 All JBE Pathfinder PDFs are 75% off their regular price including Deadly Delves: The Chaosfire Incursion . Download now. Running the higher levels while waiting for the new edition? Check out this adventure.